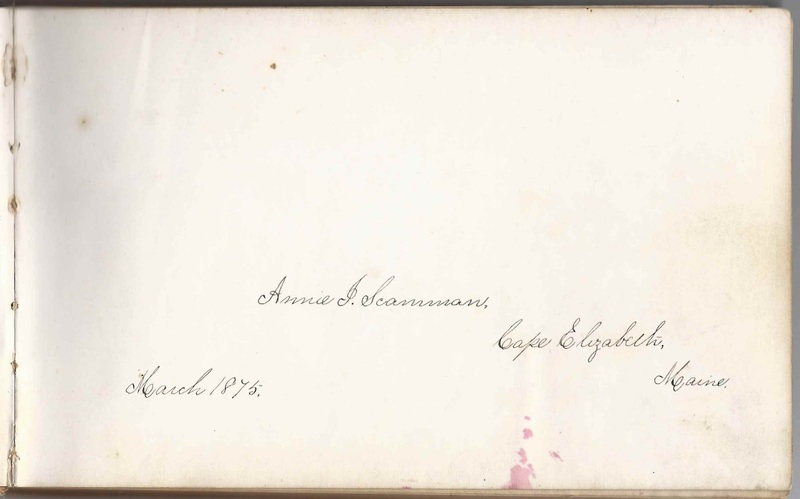 1870s/1880s autograph album that belonged to Annie Isabel Scamman of Cape Elizabeth, Maine, who started collecting sentiments in March of 1875. 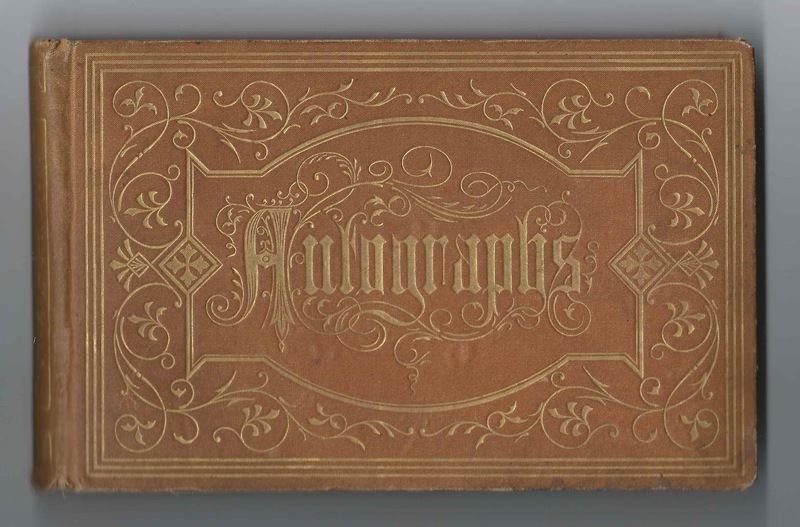 The album is approximately 8" x 5" and contains the sentiments of 86 of Annie's relatives and friends. An alphabetical list of the signers appears at the end of this post. Many of the pages were signed at Alton Bay, New Hampshire, presumably at a religious retreat. Annie Isabel Scamman was born 19 March 1850 at Cape Elizabeth, Maine, the daughter of Daniel Francis Scamman and Martha Jane (Parsons) Scamman. Daniel Francis Scamman was the son of Richard Scamman and his second wife Mary (Brown) Moon Scammon, the widow of Thomas Moon. I don't believe Annie ever married. She worked as a stenographer and assistant at the Northeastern Telephone Company and lived at South Portland, Maine, at least until 1920. She died in 1924. 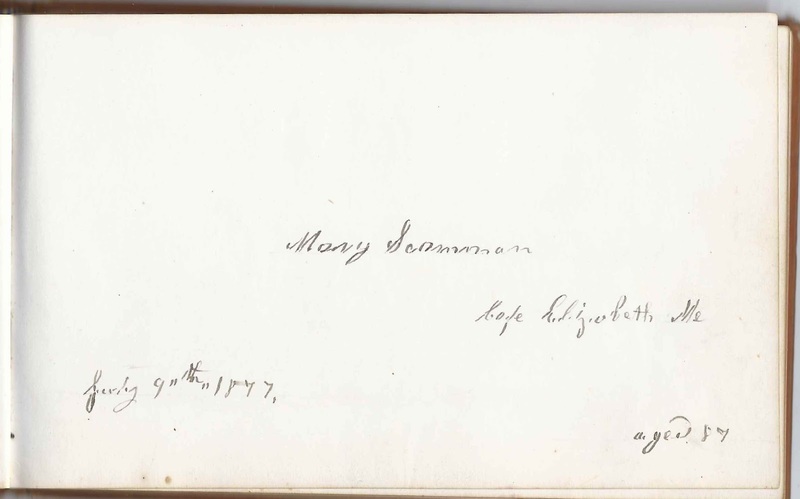 Annie's paternal grandmother, Mary (Brown) Moon Scamman, signed a page in the album at Cape Elizabeth on July 9, 1877, when she was 87 years old. 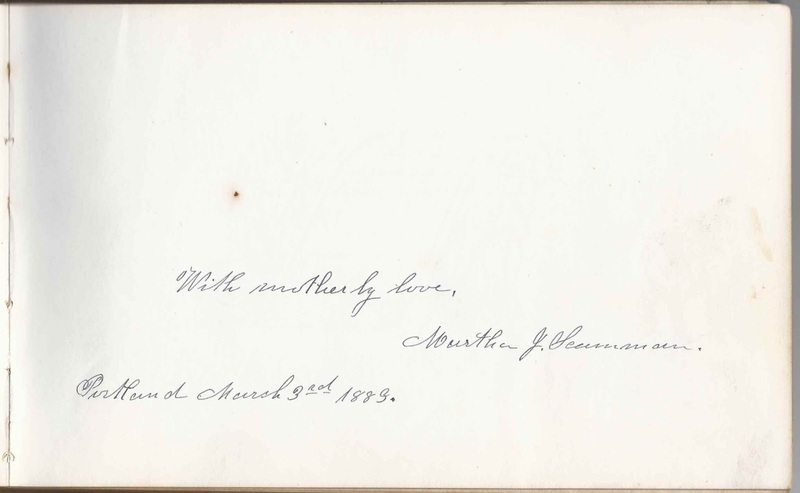 Annie's mother, Martha Jane (Parsons) Scamman signed a page, "with motherly love", at Portland, Maine, on March 3, 1883. 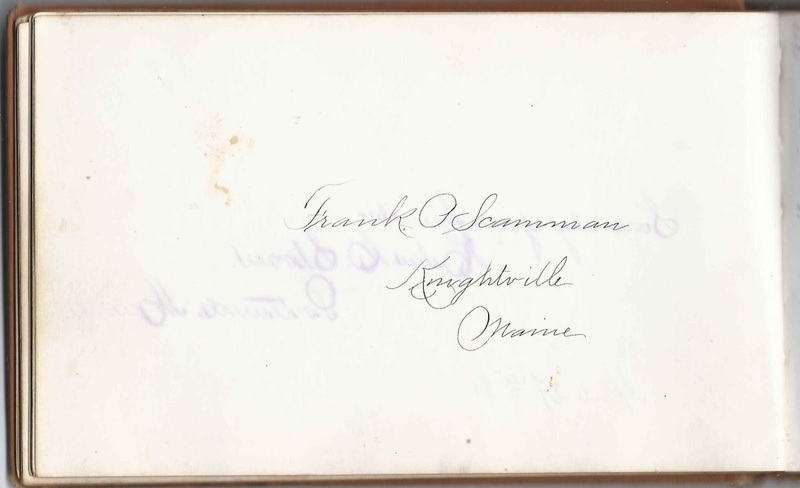 The Frank P. Scamman of Knightville, Maine, who signed a page in the album was presumably Annie's brother Frank Parsons Scamman. 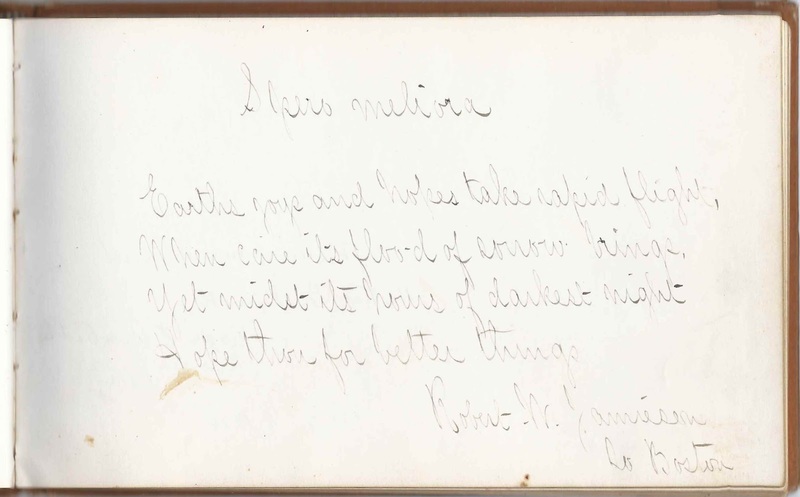 Annie's sister Eva signed a page on May 6, 1876. Annie wrote notes regarding marriages and deaths on a few of the pages. On her sister's page, she wrote "Married Higgins '77". Eva was Eva Caroline Scamman who married Frederick Othello Higgins of Worcester in 1878. Sadly, Fred died in 1879. Eva later married Robert W. Jamieson of South Boston. Both Fred and Robert signed pages in Annie's album. Frederick Othello Higgins was born 22 January 1856 at Worcester, Massachusetts, the son of Elon Galusha Higgins and Lucy M. (Graves) Higgins. He married Eva Caroline Scamman on 26 April 1877 at Worcester, and died there on 2 October 1879. I don't believe he and Eva had any children. Robert W. Jamieson was born about 1850 at Manchester [presumably Massachusetts], the son of Robert and Harriet E. (Townsend) Jamieson. Robert and Eva married at Boston, Massachusetts, on 26 June 1883. Many of the other signers were Scamman and Parsons relatives. Please refer to the alphabetical list below. 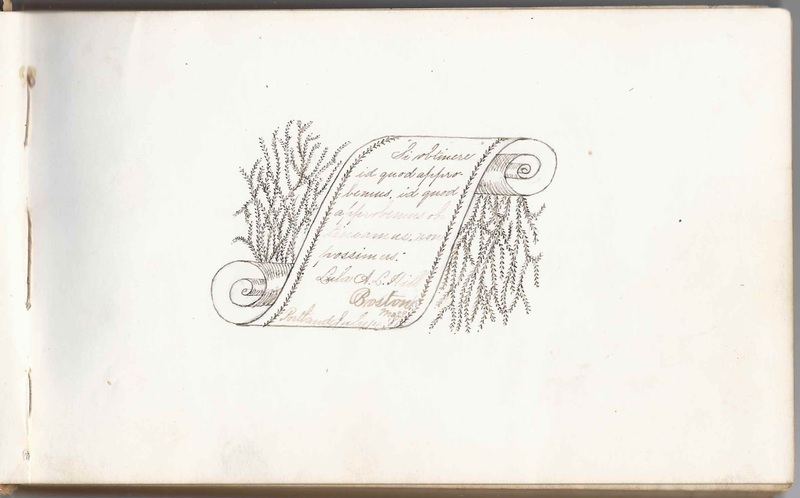 The page signed by Lula A. L. Hill of Boston, Massachusetts, featured Lula's intricate sketch of a scroll. Franklin P. Berry of New Durham, New Hampshire, signed on August 28, 1876. He signed a later page at New Durham Bridge, New Hampshire, on September 5, 1881, after his marriage to Emma I. (Davis) Berry, who also signed that page. Mrs. Emma I. Berry of New Durham Bridge, New Hampshire, signed on September 5, 1881. She was Emma I. (Davis) Berry, whose husband Franklin P. Berry also signed the page; he signed another page in 1876. Mary E. Chase of New Durham, New Hampshire, signed on August 27, 1876. She noted some dates in each corner. Clara J. Giddings, signed on June 4, 1878. Later penciled note: Died in Calais, Maine, 1885". Clara and her sister Ella, who signed the right facing page, were the daughters of John Smith Giddings and Jane E. (Bancroft) Giddings of Calais, Vermont. The note writer was apparently in error about Maine. 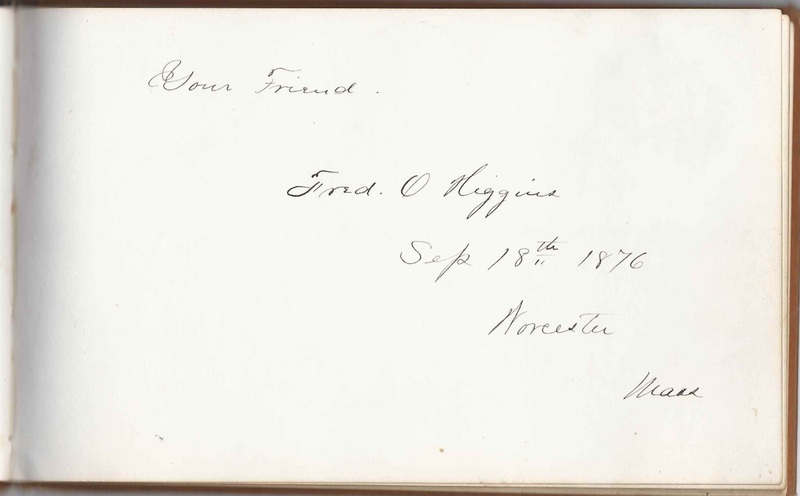 Francis E. Higgins, signed at Worcester, Massachusetts, on June 5, 1878. Presumably Francis Elon Higgins, brother to Frederick Othello Higgins, first husband of Annie's sister Eva Caroline (Scamman) Higgins Jamieson. Fred O. Higgins, signed on September 18, 1876 at Worcester, Massachusetts. He was Frederick Othello Higgins, first husband of Annie's sister Eva Caroline (Scamman) Higgins Jamieson. Fred's parents were Elon Galusha Higgins and Lucy M. (Graves) Higgins. Sadly, Frederick Othello Higgins died 2 October 1879. Charles A. Higgins of Worcester, Massachusetts. Presumably Charles Albert Higgins, older brother of Frederick Othello Higgins, who was the first husband of Annie's sister Eva Caroline (Scamman) Higgins Jamieson. Jennie L. Higgins of Worcester, Massachusetts, signed on June 1, 1878. She was the daughter of Francis Wayland Higgins and Harriet Higgins. Francis was the uncle of Frederick Othello Higgins, first husband of Annie's sister Eva Caroline (Scamman) Higgins Jamieson. Lula A. L. Hill of Boston, Massachusetts, signed at Portland, Maine, on July 14, 1881. She sketched a intricate scroll and incorporated her name and message into it. Robert W. Jamieson of South Boston, Massachusetts. He was the second husband of Annie's sister Eva Caroline (Scamman) Higgins Jamieson. Josie M. Lewis of Lynn, Massachusetts, signed on October 6, 1875. Later penciled note: "Married Sawyer '77". There's a Massachusetts Marriage Record for a Josie M. Lewis who married Frank D. Sawyer at Lynn, Massachusetts, on 24 December 1877. Josie was the daughter of George and Elmira Lewis. Mattie E. Libby, signed at Meriden, Connecticut, on 9-12 [can't decipher year]. Later penciled note: "Married Libby '77"
Jennie Marriner of Cape Elizabeth, Maine. She was Jane R. (Libby) Marriner, "Jennie", daughter of Nathan Libby of Saccarappa, Maine, and wife of Jabez Marriner, who signed the left facing page. E. Moulton; middle initial might be S or I or ? Inscribed to "Sister Anne", which may have been a religious rather than family reference. Ida Nathans; middle initial could be C. or O. or ? Eugene B. Parsons of Medford, Massachusetts, signed on July 11, 1880; Annie's cousin, presumably the son of William Henry Parsons, who was a brother to Annie's mother Martha Jane (Parsons) Scamman. M. Belle Pickering of Lowell, Massachusetts, signed at Alton Bay, New Hampshire, in 1876. From a Massachusetts Marriage Record: Mary Isabelle Pickering married William W. Norcutt at Springfield, Massachusetts, on 31 March 1881. Sophie C. Sawyer of Chicago, Illinois, signed on June 7, 1876; has a later penciled notation: "Married Dupre"
Addie M. Sawyer, signed on June 7, 1876. 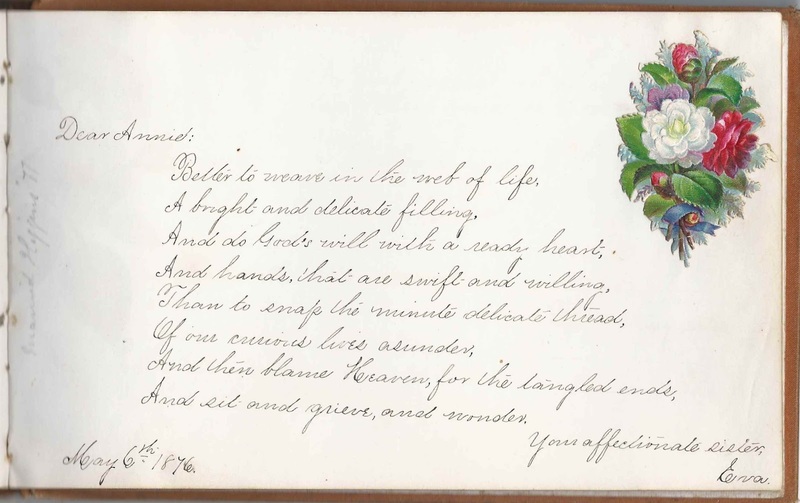 Later penciled note: "Died"
Martha J. Scamman, signed at Portland, Maine, on March 3, 1883. She was Martha Jane (Parsons) Scamman, Annie's mother. Emma, signed at Cape Elizabeth, Maine, on July 10, 1877; Annie's cousin. She was presumably Emma Louise Scamman, daughter of Ezra and Mary A. (Moon) Scamman and wife of Atwood T. Brackett, son of Joshua and Adelia B. (Redlon) Brackett. Ezra Scamman was a half-brother to Annie's father, from Richard Scamman's first marriage to Elizabeth Small. Mary Scamman of Cape Elizabeth, Maine, signed on July 9, 1877. "age 87". Presumably Mary (Brown) Moon Scamman, paternal grandmother of Annie I. Scamman, album owner. She was the daughter of Philip and Margaret Brown; married first Thomas Moon and later became the second wife of Annie's paternal grandfather Richard Scamman. Mary Ann Scamman of Cape Elizabeth, signed on November 3, 1877. She was presumably Mary Ann (Moon) Scamman, daughter of Thomas Moon and Mary (Brown) Moon Scamman, and wife of Ezra Scamman, who was a half brother to Annie's father Daniel Francis Scamman. Her mother, Mary (Brown) Moon Scamman was the second wife of Richard Scamman, father of half-brothers Ezra Scamman and Daniel Francis Scamman. Eva, signed on May 6, 1876. Later penciled note: "Married Higgins '77." Annie's sister Eva Caroline (Scamman) Higgins Jamieson, whose first husband was Frederick Othello Higgins. James Slater of Bangor, Maine, signed on October 27, 1876. He was James F. Slater, born 23 January 1826 at Portland, Maine, son of James and Betsey (Davis) Slater, and husband of Eliza B. (Parsons) Slater, who signed the right facing page. His wife Eliza was a sister to Annie's mother Martha Jane (Parsons) Scamman. Eliza B. Slater of Bangor, Maine, signed on October 27, 1876. She was Eliza B. (Parsons) Slater. Her husband James F. Slater signed the left facing page. Eliza was a sister to Annie's mother Martha Jane (Parsons) Scamman.
? Waterhouse, signed at Cape Elizabeth, Maine, in June 1876. Initials might be C. H. for Charles H. Waterhouse, or could be C. G. or A. G. or ? Mattie Wright, signed on August 12, 1879 at Brookline, Massachusetts; middle initial could be T or ? She was Martha (Jaquith) Wright, daughter of Nahum Wright, and wife of William L. Wright, who signed the same page. William L. Wright, signed at Brookline, Massachusetts. He was the son of William R. Wright and Ruth (Chadwell) Wright and husband of Mattie Wright, who signed the same page. Josie Young of Chelsea, Massachusetts, signed on September 1, 1876. Later penciled note: "Married Browne, January 1, 1878; Died August 22, 1878." Based on the note and a Massachusetts Marriage Record, it appears that Josie was the Josie Young born at East Boston, Massachusetts, about 1856, daughter of Benjamin and Lucy Young. Josie's husband was Charles A. Browne, born at Richmond, Maine, about 1853, son of George W. and Azubah Browne.